Last month I learned the heartbreaking news that my beloved Studio Ghibli was shutting down indefinitely. The legendary Japanese animation studio, founded by the incredible Hayao Miyazaki, has produced some of the greatest films of all time. Their movies enable audiences both young and old to be transported to fantasy lands that fuel the imagination with tales of extraordinary adventures. Studio Ghibli’s films are cherished by audiences for offering strong, realistic heroines. Ghibli films like Spirited Away, Howl’s Moving Castle and Kiki’s Special Delivery Service all feature female protagonists. In comparison to Western animation houses like Disney, Pixar and Dreamworks, Ghibli’s long-standing focus on female characters is truly revolutionary. Disney heroines have only recently come into their own, with films like Brave and Frozen shifting the focus away from romantic love. Ghibli’s heroines are more concerned about saving the world than singing about their woes. Spirited Away, Howl’s and Kiki are all incredible Studio Ghibli films with extraordinary female leads, but it is Miyazaki’s 1997 film Princess Mononoke that is perhaps the most female-empowering piece of cinema in the studio’s repertoire. Set in an alternative version of imperial Japan, where demons, forest gods and humans all live in constant battle with one another, Princess Mononoke follows Ashitaka, a brave, young prince who is cursed by a demon while trying to save his village. Ashitaka is told that this curse will eventually kill him unless he leaves the village, travels West and finds peace within himself. On his journey he faces much adversity, confronting gods, demons and selfish humans. But it’s his encounter with San, a fearless girl who was raised by a pack of wolves, that is the most significant. San is known by the humans in the land as the Wolf Princess (or Princess Mononoke) and her wolf mother, Moro, is one of the gods of the forest trying to save the environment from the humans that so desperately want to destroy it. The film has a very strong pro-environmental message; it focuses on the selfishness of humans who are disrespectful to the natural world. But Princess Mononoke also has a very strong underlying feminist message. The female characters exist to do more than just propel Ashitaka’s story; they are well-rounded, complex and incredibly powerful characters. San is without a doubt the most interesting and complex of all the characters in the film. Although she’s human, she honestly and wholeheartedly believes that she is a wolf and a part of the forest itself. She cannot stand Ashitaka’s insistence that she is in fact a human being and initially hates him. She could be seen as stubborn and austere, but her courage and determination to save the forest from the humans is endearing; she’s an admirable and inspirational figure. Like many Miyazaki characters, San is not a stereotypical heroine and she has both good and bad sides; in other words, she is a complex and realistic character. She is often very violent and has a very short temper, by-products of her wolfish upbringing, and is frequently frustrated by the indifference of the humans to the natural environment. She also has a compassionate side, and we see her taking care of both her mother and Ashitaka. Aside from San, the film is filled with incredibly complex female characters that play a far more important role in the narrative than any of the male characters. San’s wolf mother, Moro, is one of the most powerful gods in the forest, who has raised San and her cubs to defend themselves and the things they love. She is feared not only by the humans but also by the other gods; she is a caring mother to San and has a self-sacrificing nature. Lady Eboshi, the owner of the town’s ironworks, is one of the selfish humans, trying to destroy the forest for her own financial gain, though she is ultimately a morally ambiguous characters. The women of the ironworks themselves are also incredibly interesting characters. Led by the fearless Toki, they protect the town when Lady Eboshi is away and are portrayed as more courageous and strong than their dim-witted husbands, who are often used as the film’s comical relief. 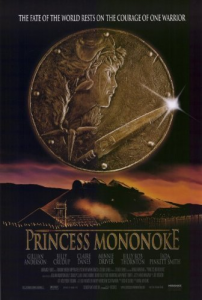 Although Princess Mononoke focusses on a mythical world populated by princes and princesses, the film is less a fairytale and more of a nightmare. Twisted imagery turns the typical Disney tropes of love and happily-ever-afters on their heads as the forest and those who inhabit it become crazed by the power it holds. Despite the fact that the story ends with the forest being saved, the film still defies the Disney formula: San and Ashitaka do not end up together despite their supposed chemistry, and many conventional filmic moments that, in a lesser film, make up the standard love story cliches. After Ashitaka’s curse is healed and San is free from protecting the forest, they end the film owning themselves and not each other. Like so many of Studio Ghibli’s films, Princess Mononoke allows audience to see a complex and diverse range of female characters lead the story instead of blending into the background. Studio Ghibli shows realistically flawed but ultimately empowering female characters as both heroes and villains. It’s clear that all young girls should be watching Studio Ghibli. I loved this film! One thing I found interesting (and contrasting to Western films) was Lady Eboshi as a villain: she wasn’t sexualised. In so many popular films I watch – from the US, the UK, or homegrown – women who have power are portrayed in a super sexual manner. This implies that the only way women can gain power is through their sexuality. G’day Jade! I’d love to hear what you think of “Nausicaä of the Valley of the Wind”, the older Miyazaki film with lots (lots!) of overlap with Princess Mononoke, except that the plot revolves around much more around Nausicaä herself.